OK, so the MRI showed two bulging disks, L-4 and L-5, with a slight tear in the L-5. The Chiropractor explained that is what caused me to end up on the floor for those hours, since the tear allowed the fluid inside the disk to ooze out and the muscles around it screamed "DUDE, you ain't moving!" I am now on the MRX Machine which is basically a table that they strap you into around your waist and there is a cord that extends down and the machine pulls you in a series of increasing pressure over a half hour. Spring Training has begun...Have any interest in playing in a Fantasy Baseball League? We have one started on espn.com. The Victorious Secret League...No cost...just some fun and a ton of ribbing between team owners. If you are interested, send me at email at yoursbond@yahoo.com and I will make sure you are sent an invitation from the league commissioner MRS. BRAD TURNBABY of "Pointless Drivel" infamy. Just think...you can draft all the steroid-heads and then cut them from your roster and feel the satisfaction of putting them onto the trash heap. We really want to get 12 players who we know into the league or we will be forced to accept unknown aliens who might kick our a**es...so players with no skill are really wanted! It didn't matter that his DeKalb, Ill., High School basketball team had ridden a bus two and a half hours to get to Milwaukee, then waited another hour past game time to play. Didn't matter that the game was close, or that this was a chance to beat a big city team. Something else was on Dave Rohlman's mind when he asked for a volunteer to shoot two free throws awarded his team on a technical foul in the second quarter. His senior captain raised his hand, ready to go to the line as he had many times before. "You realize you're going to miss them, don't you?" 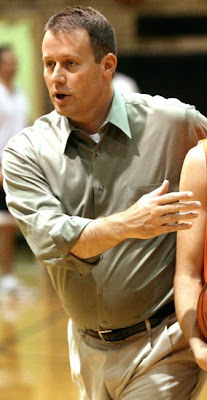 Coach Dave Rohlman of DeKalb HS said. It was a Saturday night in February, and the Barbs were playing a non-conference game on the road against Milwaukee Madison. It was the third meeting between the two schools, who were developing a friendly rivalry that spanned two states. The teams planned to get together after the game and share some pizzas and soda. But the game itself almost never took place. Hours earlier, the mother of Milwaukee Madison senior captain Johntel Franklin died at a local hospital. Carlitha Franklin had been in remission after a five-year fight with cervical cancer, but she began to hemorrhage that morning while Johntel was taking his college ACT exam. Her son and several of his teammates were at the hospital late that afternoon when the decision was made to turn off the life-support system. Carlitha Franklin was just 39. "She was young and they were real close," said Milwaukee coach Aaron Womack Jr., who was at the hospital. "He was very distraught and it happened so suddenly he didn't have time to grieve." Womack was going to cancel the game, but Franklin told him he wanted the team to play. And play they did, even though the game started late and Milwaukee Madison dressed only eight players. Early in the second quarter, Womack saw someone out of the corner of his eye. It was Franklin, who came there directly from the hospital to root his teammates on. The Knights had possession, so Womack called a time out. His players went over and hugged their grieving teammate. Fans came out of the stands to do the same. "We got back to playing the game and I asked if he wanted to come and sit on the bench," Womack said during a telephone interview. "No," Franklin replied. "I want to play." There was just one problem. Since Franklin wasn't on the pre-game roster, putting him in meant drawing a technical foul that would give DeKalb two free throws. Though it was a tight game, Womack was willing to give up the two points. It was more important to help his senior guard and co-captain deal with his grief by playing. Over on the other bench, though, Rohlman wasn't so willing to take them. He told the referees to forget the technical and just let Franklin play. "I could hear them arguing for five to seven minutes, saying, `We're not taking it, we're not taking it," Womack said. "The refs told them, no, that's the rule. You have to take them." That's when Rohlman asked for volunteers, and McNeal's hand went up. "They may not remember our record 20 years from now, but they'll remember what happened in that gym that night", said Dave Rohlman, head coach of the opposing DeKalb team on what his players will take away from this experience. Franklin would go on to score 10 points, and Milwaukee Madison broke open the game in the second half to win 62-47. Afterward, the teams went out for pizza, two players from each team sharing each pie. Franklin stopped by briefly, thankful that his team was there for him. "I got kind of emotional but it helped a lot just to play," he said. "I felt like I had a lot of support out there." Folks...this is what sports are all about and I stand and applaud Coach Rohlman. Some people believe that individuals in sports should not be considered worthy of hero-worship...coaches such as this ARE heroes in my mind. The Christmas card didn't come with an explanation, but judging from the holiday portrait, Mike Ray's family had obviously grown. Standing to the right of Ray's wife, Billie, and behind their two children, Cullen and Conrad, was a 6-foot-3, 315-pound African-American teenager named O.C. Brown. Manassas standout O.C. Brown bonds with the extended family he stays with weekdays, the Rays (left). With them is Manassas coach Bill Courtney and his family. and Ethel Hayes, 67, in their North Memphis home. "It started out with the goal of getting the grades up. That was the main goal," said Ray, a volunteer assistant football coach at Manassas High. "But when someone lives with you, they become part of the family. That's just the way it works." Brown, a junior offensive tackle and one of Shelby Metro's top college prospects in the class of 2010, has lived on weekdays with the Rays in their 7,000-square-foot Germantown home since October, when Ray and his friend, sixth-year Manassas offensive coordinator Bill Courtney, realized Brown's poor grades were jeopardizing his chances of going to college. His football potential was unquestionable. At more than 300 pounds, Brown could get down the field like a running back, and college programs were starting to take notice. "Mike got his transcripts and said, 'You know, Bill, he's not failing anything, but he's got to do better,'" said Courtney, who last spring convinced Ray, a neighbor and former lineman at Arkansas State, to help out as a volunteer coach for Manassas. Brown's grandmother, Ethel Hayes, his legal guardian, was already threatening to take Brown off the team if his grades didn't improve. So Courtney and Ray, while driving to McKenzie, Tenn., to scout the Tigers' first-round playoff opponent, came up with a plan. "Mike said, 'How are we going to do that?' And I said, 'We've got to tutor him at night.' But the problem was there weren't any tutors that we could get that were going to go to New Chicago at 8:30 on a Tuesday night to tutor him." Ray, a full-time salesman for FedEx Custom Critical, had gotten to know Brown well in his first season as the Tigers' line coach. He had taken Brown and a few of his teammates on an unofficial recruiting visit to Arkansas State. Ray had an extra room at home, but he would have to get it by his wife, Billie, if Brown, whom she had also gotten to know fairly well through her husband, was going to live with the Rays on a daily basis. "I said, 'What would you think about doing this?' And she's like, 'Well, I don't know,'" Ray said. "Then we started talking about it and she said, 'Who is it?' and I said, 'O.C.,' and she goes, 'Oh. I don't care. That's fine,' because she already knew him." And O.C. 's grandmother? Would she go along with the plan as well, allowing Brown, whom she had raised along with four other of his siblings since he was 2, to live with a well-off white family she barely knew? "They always have had an interest in O.C., and they have kind of put their arms around him," Hayes said. "I knew they were going to take good care of him." As big and strong as he is, Brown's voice is soft. 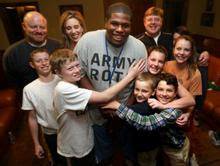 His quiet, church-boy demeanor off the field hardly seems to match his imposing size as a 16-year-old. "He's kind of like a Clark Kent," Manassas head football coach Tommy Warren said. "He's mild-mannered, like a gentle giant, without the pads on. But once he puts those pads on, it's a different story. I'm serious." While at Humes Middle School, Brown was pushed ahead a grade from the sixth to the eighth, "because he was so big," Courtney said. It explains why Brown is a year younger than most of his junior peers and had struggled to keep up at Manassas in subjects like math and history. "O.C. doesn't have a mental deficiency," Courtney said. "What he had was a lack of emphasis on his grades." "He was doing what it takes just to get by," said Brown's older sister, Rachel Hayes, 27, a teacher at Havenview Middle School who helped raise Brown. As part of the plan to get Brown's grades up, Courtney, whose children attend St. George's Independent School, hired St. George's senior and National Merit Semifinalist Adeline Brown to tutor him three hours a week at Ray's home. "He came down the stairs and I was like, 'Oh, my God!' because he's so big," she said. "He's a very quiet guy, but he's the nicest guy ever. "The whole time, I could tell he was smart. As soon as I'd explain something, he'd catch right on. I mean, we've had to cover a lot and we're still working on it, but he's definitely picking up stuff really fast and he's working hard at it." Courtney, owner of Classic American Hardwoods in the Manassas neighborhood, drives Brown to school each morning on weekdays, then back to the Rays' home after school. Brown spends weekends with his grandmother and other siblings at Hayes' modest home in New Chicago, the poverty-stricken North Memphis neighborhood surrounding Manassas. "I feel like a king," Brown said. "I liked it from the start, because I knew they were trying to help me. "It's fun. First, I've got to do my work and stuff, and then I have the rest of the day to play and work out and stuff like that." The arrangement, so far, has worked, though Brown admits he sometimes worries his teammates might become jealous of the extra attention he's received from Courtney and Ray. One of Brown's teammates, Manassas junior center Julius Martin, has slept over on occasion with Brown at the Rays' home, but not regularly. Ray said he feels guilty he can't offer the same opportunity to more of Manassas' players. "He made a 3.0 (grade-point average), and we've only had him half the semester. But there's a lot of kids out there that could do just as good as O.C. if they were given the same opportunity, and they're not. And there's no way we can save them all," Ray said. "It just so happened there were three or four things, where he was a nice kid and we knew he was a talent going to waste if something didn't happen. I don't want to say we chose him. We kind of chose each other. But I feel bad personally that people like Julius could do the same thing." Courtney said some of his friends and colleagues have expressed amazement at the coaches' willingness to open their homes to Brown. Courtney said he doesn't see it that way. "Nobody wants to understand the real story is, 'How about him?'" Courtney said. "Why don't you be a 16-year-old black kid whose total exposure to the world stopped at the New Chicago boundary line, and all of a sudden, you're going to turn your world upside down and go live with a bunch of white folks in Germantown, with their rules and with the way they do things -- all so that you can get your grades better and get in school. "The real story is not the commitment and the sacrifice we've made. He's the one living away from his family. He's the one that's had to adapt." Brown sees it more as an opportunity, and one he's not willing to waste. "I think they're doing it to try and help me because they know I can make it somewhere," Brown said. Brown lost his mother, Shelia, to a brain aneurysm in 1999. "High blood pressure and not taking her medication," said Shelia's mother, Ethel Hayes. Brown's uncle, Tony Hayes, a former Memphis police officer, was shot and killed in 2006 by his girlfriend, a former deputy jailer who stuffed Tony's body in the trunk of his Lexus. Brown missed practice to help look for his uncle when he was missing. "He was upset about that one," Ethel said. "He was upset." Brown's father, O.C. Wier, lives in Whitehaven. "I see him," Brown said. Yet it's Ethel who has raised Brown since he was a toddler, having taken custody of him and his four siblings. "The mom wasn't doing what she was supposed to do," Ethel said. "I said, 'Well, it's gotta end somewhere.' So I went down to court and explained to them what was going on because I had to get custody of them because she's not taking care of them." 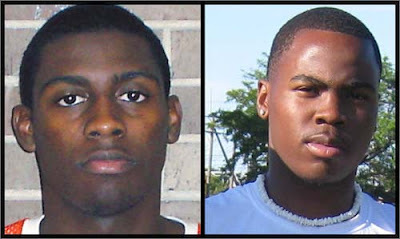 The tragedy in Brown's life, and Courtney and Ray's plan to take Brown in on a weekly basis, has led some of their friends to compare their story to that of Ole Miss senior offensive tackle Michael Oher, the former Briarcrest Christian standout. Oher's abandonment as a child by his birth mother and eventual adoption by Memphis Grizzlies radio analyst Sean Tuohy and his wife, Leigh Anne, was detailed in the best-selling book, "The Blind Side," by Michael Lewis. "I've heard this name 50 times since people kind of found out about O.C. They're like, 'Oh. Michael Oher,'" Ray said. "I read the book about a month after he lived here, and there's some similarities, but it's not the same. I mean, Michael Oher was virtually homeless." Brown, too, has heard of Oher, but said their situations are different. "I knew there was a book," he said. "I think the book said his family and stuff didn't love him. I got a family, though." According to Courtney and Ray's families, he has three. "I think the best thing about O.C. is he's fun. Real fun. He's always playing with us," said Courtney's son, Will, 11, one of four Courtney children who, like Ray's kids, Cullen and Conrad, have grown very fond of Brown. "He does belly-flops and it makes the whole floor shake!" Will's brother, Max, 10, said. Courtney's wife, Lisa, said she values the interaction between her children and Brown, whom they likely would never have come to know had Courtney not volunteered at Manassas some six years ago. "I look at my kids, and they're given every opportunity. They have all they need. But a lot of these children don't, and I am willing to give up the time that (Courtney) spends with them," Lisa said. "I love that my children are exposed to different cultures, because I teach my kids to see through the heart. Don't look at color; look at what's in their heart." For Christmas, Hayes sent Ray's wife, Billie, a miniature waterfall. It was important to her that Billie received a Christmas present from Brown. "It means a lot to me for them to think that much of us, and especially of O.C., and want the best for him. I don't even know how to explain it," Hayes said. "I just want him to be able to go to school and get his grades like they need to be, and make a decent life for himself. He doesn't have to be an NFL football player. Whatever he wants in life, that's what I want him to have. "And this is something he wanted to do." One horrible thing about this story is that this young man was forced to skip the seventh grade 'because he was too big'...the school system was WRONG for doing that. What is good but not emphasized in this story, which I learned while researching, is that neither of these coaches gets paid for their coaching this team. They travel to a very under-privileged part of the city, where many would not even drive through at 80mph. They have also told O.C. they want nothing back from him except one thing...if he goes on to play in college and possibly into the NFL, or if he graduates college and takes an office job, they told him they want him to come back to his old neighborhood and help another deserving student - to give someone else the opportunities afforded him. O.C....good luck to you, I am hopeful you take this great opportunity and make the most out of it. Again, I stand and applaud Coaches Mike Ray and Bill Courtney. I heard about the technical foul shot story. It's a beautiful thing. Have a great weekend and heal up. Cheers Vinny!! Wonderful stories, Vinny. Thanks for sharing; it renews my hope in youth leaders. Very wonderful stories and reminds us what sports are really about. It's not supposed to be just the winning and losing, but more. And these coaches understand that. Great, very inspiring. I hope your back is helped...and that some sort of normalcy returns. However....If you keep posting stories that make me cry, I'm gonna smack you. That first story is very heartwarming. Much more so than the story about the girls high school b-ball team in Dallas that beat that team of mentally handicapped kids 100-0. The second story is also a great story and I wish nothing but the best for that kid. But, it also brings up a lot of things that bug the crap outta me about our public school system. JAY: Which is why I mentioned the point of him being pushed ahead because he 'was too big'...what crap. I have been made aware that many people blasted this article with 'oh sure, because he is a sports star, but what about all the kids who aren't, why aren't they taking them in'...but again, they are asking for NOTHING from this boy...and you can't help everyone, can you? Well ... you know I've dealt with the "too big" issue, and the expectations that a CHILD act like he looks rather than what his age actually is. I continue to fight these battles. Ugh Vinny-that does NOT sound comfortable at all! I hope that your back starts feeling better fast. MAGS: Thanks...slowly but surely it should get better once all my travels end. Thanks for reminding me to ask about you link over at my place. I put in your blog address just as I did all the others, and for some reason it isn't updating it. When I click on it, it gives me an error message of "page not found" I have no idea why this is happening. Quilly's is also not coming up. All the other ones seem to work fine though. Well at least you don't have to have surgery. That's a plus. And thanks for those two stories. It takes an opportunity. And then the kid has to take advantage of it. That does indeed sound painful. I've had a bulging disk at L-5. It is NOT fun but chiropractors seriously scare me. Are you SURE they know what they're doing??! It sounds like you're in a torture chamber. I agree with Trav nothing better than to avoid a operation! JEFF: Make sure it is spelled correctly and not leading to a specific post date. TRAVIS: A BIG plus...at least for now. The technical shot story ran on ESPN today!